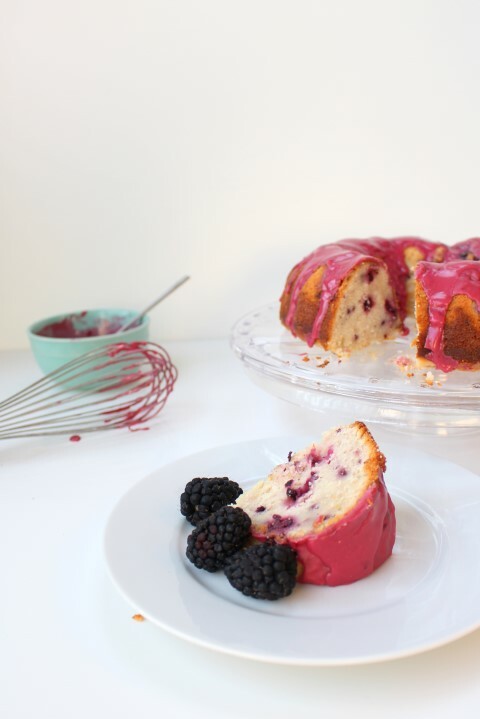 An ultra moist cake featuring fresh blackberries and sunshiney lemon. A perfect taste of summer. There are a few things that make this cake my favorite of summer. First, its made in a bundt pan. No fighting with finicky layers, or worry about complicated filling recipes. Just mix up the batter, bake and frost. Second, The key to this ultra moist cake is the yogurt. I have found the Greek yogurt works undercover in the batter to make the it ultra moist without being heavy. It is actually similar to my lemon blueberry bread recipe. And lastly, blackberry and lemon were just meant for a bakery marriage. Together they compliment each other perfectly as neither one is overly sweet. 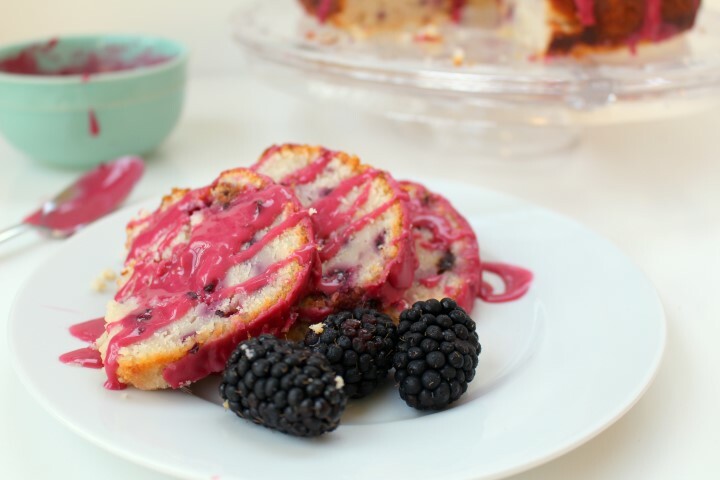 This lemon blackberry yogurt cake is finished with a blackberry glaze. Start with blackberries and cook them in some water to soften them and then strain them. Stir in some powdered sugar and milk and you have a gorgeous glaze . You may notice in the pictures that I glazed the cake twice. Yep, that would be me who was in such a hurry to photograph my pretty cake that I made the glaze a bit too runny and frosted a warm cake. I’ll leave it as a lesson to myself and an encouragement to you that not everything you make will be or has to be perfect. It still tasted delicious. What are your favorite summer fruit’s to bake with? Preheat oven to 350 F. In a stand mixer, or by hand if your feeling strong, cream together butter and sugar until light and fluffy. Beat in eggs, lemon juice and zest. In a separate medium bowl, whisk together, baking powder, salt and flour. Add alternately with the Greek yogurt to the wet ingredients. Mix until just combined. Gently fold in blackberries. Bake at 350 F. for 55-60 minutes until an inserted toothpick comes out with a few moist crumbs clinging to it. Let cool in pan for 15 minutes before inverting onto wire rack. Let cool completely. To make the glaze, combine blackberries, water and sugar in a small saucepan on the stove, Simmer for about 5 minutes over medium heat until the blackberries are very soft. Strain through a fine mesh strainer to remove the seeds. Beat in powdered sugar until a glaze forms. If it is too stiff and a drop or two of water at a time. Drizzle over cooled cake. This sounds delicious, I would surely gobble up that glaze!! I wish I had a slice for breakfast! I adore blackberries so I love you filled this cake with them. 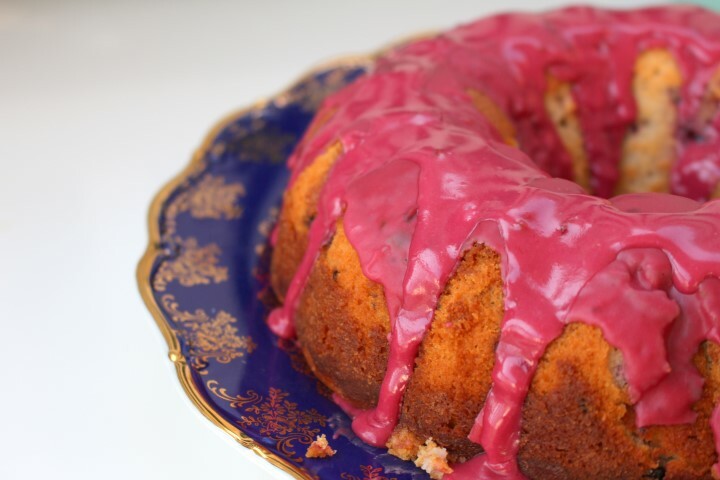 I’m with you… I love baking in bundts – I’m not a fan of layers either. And blackberries and lemon?? Oh my heaven!! I’m not sure you could have picked a better combo! Blackberry and lemon is one of my newest favorites. Thanks, Kim!